As my husband says, “Finished” is a relative term to a writer. For me, there’s a sense of completion when I’ve seen the shape of the book; I know what I’m working with. Then there’s the BIG “Finished,” when I’ve done with the writing–the story is All There, and in the publisher’s hands; at this point, there _will_ be a book, even if I get run over by a train. Revisions–usually very minor, and they were _really_ minor in this book–are generally done as I go along. I send my two editors (US and UK) chunks of the manuscript, and they send me their comments, and if there looks like anything that should be tweaked (often there’s not), I do that just as part of the daily writing. So the next major “Finished” is the copy-edits. The copy-editor is the unsung heroine who reads the finished manuscript One. Word. At. A. Time, looking for typos, continuity errors, infelicities (like using the same word three times in the same paragraph, or using six clauses all separated by dashes <g>), and so on. This is god-awful tedious stuff, and it’s not a lot more fun on -my- end, when it comes back and I have to check through all of the copy-editor’s queries and either answer them or do something about them. And once the copy-edits are done, the manuscript goes to the typesetters, and then we get galleys. That’s short for “galley-proofs.” These are typeset pages that look exactly as the pages will look in the book, including page numbers, gutters, decorations, etc. But I made it! The very last batch of corrected galleys went out of here by FedEx this afternoon. I’m FINISHED!! We’re done–and there _will_ be a book on June 10th! (in the US and Canada; I believe the UK/Australia/NZ are saying they plan to release it June 5th, and Germany is saying July 21st.) Hope you’ll enjoy it! Oh–I’ve had a lot of inquiries lately about getting signed copies of WRITTEN IN MY OWN HEART’S BLOOD (My Own Heart’s Blood = MOHB = MOH-B = MOBY. Geddit?). For a list of places where I’ll be going and doing signings visit my official Appearances page on this site. If you don’t live in one of those places I ‘m visiting, but do want a signed book, the simplest thing to do is probably to order it from The Poisoned Pen bookstore, here in Scottsdale. They’re my local independent bookstore, always carry ALL my titles in all available formats, and will ship anywhere in the world. Just tell them how you’d like your book to be inscribed; I normally go by there every couple of weeks to sign their orders. MOBY was wonderful, thank you so much! Well worth my sand papered eye balls- maybe I need some honey! I just finished MOBY and cried tears of joy for the ending! I won’t give anything away, but, WOW!!! Very moving! I’m so please to have become an outlander fan. I look forward to seeing the series in August and book nine sometime in the future. I am so happy for you Diana, and wish you much success in your life!! Could someone please tell if I misinterpreted what I just read in MOBY, or I am losing my memory much sooner than I would have thought. I do not remember jenny knowing about Claire coming from the future., but what I just read about what Claire said, leaves me thinking she did. If that is correct, could someone please tell approximately where I could find this, if Jenny did know, if not just let me know, that I misinterpreted what I read, and Jenny does not know. Back in “Echo” Claire and Jamie visit Lallybroch and find out Ian’s going to die soon. Jenny’s son Michael’s leaving for France and Claire decides to warn him against the Revolution to come. She tells the whole family who she is and Jenny gets really angry at her because she thinks she would not help Ian survive, which she obviously cannot. I just finished reading MOBY. I am dying for the next book as I have spent the last 3 months reading the entire series. I don’t know what to do with myself now, lol. Quick question, where in the mountains of North Carolina would you find Fraser’s Ridge on todays maps? Enjoy your books very much. I must tell you, your series got me into adult fiction. I am 28 (with 2 kids) and have always gravitated to the faster orbs of YA novels… Until I found outlander. I have read the entire series twice, and just finished my first read of MOBY. I don’t care if we have to wait ten years for the next one! I am sure it will be every bit as wonderful and engrossing as the rest of the series! You have also given me the inspiration to start writing again as I used to in highschool. Back then I got too hung up on the supposed rules, I have never been one for outlines. So I will try your method of writing as you go. Thank you! Best of luck with your writing, Katrina! I have read all the highkander books and am so VERY sorry to see the end. Can’t you continue the saga? PLEASE? Also I ordered The Exile and was so disappointd it was a cartoon!! !I wasted dollars!!!! It isn’t the end. Did I say it was the end? No. [g] There’ll be a Book Nine, in the fullness of time. As for THE EXILE…did you not notice the words “graphic novel” and the sample pages showing illustrations when you ordered the book? Hi Diana…I just finished reading all eight books and most of the little books for the second time, and I think the chapter entitled, “The Second Law of Thermodynamics,” in MOBY is probably the most brilliantly written chapter that I can recall reading. Ever. My hat is off to you. Why, thank you! I appreciate that very much. [smile] It was one of those pieces where you know what you want, but have NO idea how you’re going to get it on the page. Glad it came across for you! 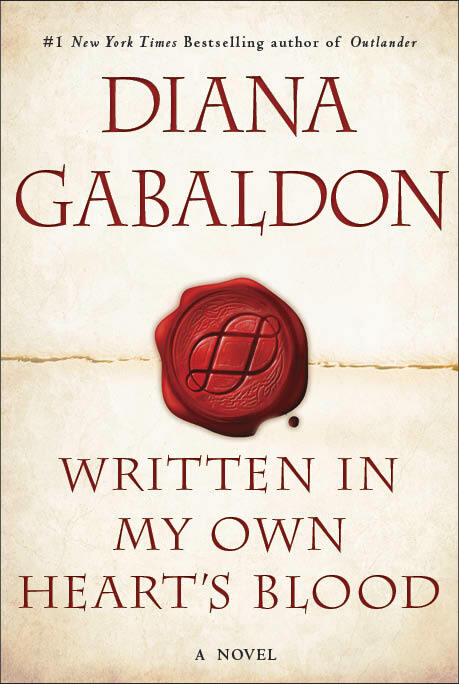 I had never heard about your books before Outlander debuted on Starz – I love all things history and the previews sparked my interest, and it took one viewing of Episode 1 for me to look you up on line. I ordered the first book of the series that same night. I am not only addicted to everything OUTLANDER now but it has also sent me exploring various historical events in more detail. I just wish I had discovered your books years ago before my mother passed away as she was a voracious reader and would have loved them as she loved everything Scottish, Irish or English. Fortunately, a gift she left with me. I can’t wait to finish the complete series (which, hopefully, will make it to the small screen as well). I am in awe of you. Thank you. I have just finished “Written in my own hearts blood”. Loved the whole series. Looking forward to your next series! You write with such depth and feeling – Bravo! Um…the Outlander series isn’t finished yet. [g] Book 9 is (very slowly) getting underway.